I’ve spent a lot of time tutoring kids in the lower elementary grades. We’ve worked on math a lot. Time after time, I’ve seen understanding click as soon as I introduced math manipulatives. It’s a great way to work on counting, addition, subtraction, multiplication, and division. Your fingers work to move the items. Your eyes see and make connections. Suddenly a math concept becomes much more clear. Grab some manipulatives and let’s get started with these subtraction with loose parts math activities. You’ll need some subtraction problems and some loose parts. I took a few index cards and wrote some simple subtraction problems. 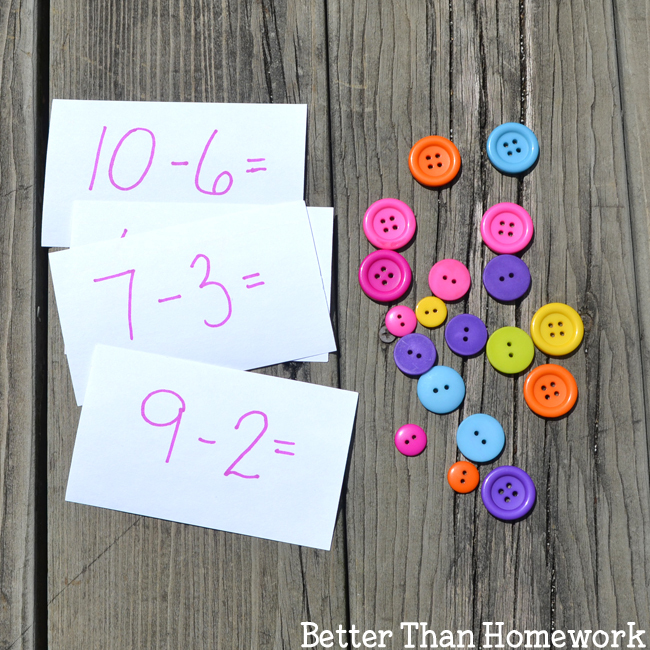 Write random problems or choose any group of subtraction facts that your child needs to work on. You’ll also need some math manipulatives. Choose something small like rocks, mini erasers, buttons, or even LEGO blocks. You just want to make sure you have enough loose parts to work each of your subtraction problems. Using loose parts helps a child easily see and better understand how subtraction works. Start with the first number in your subtraction problem and count out that many items. Next, remove the amount of your second number in your math problem. Count up the remaining items and you have the answer to your subtraction problem. Work through all your subtraction problems using your math manipulatives. *Use larger numbers. 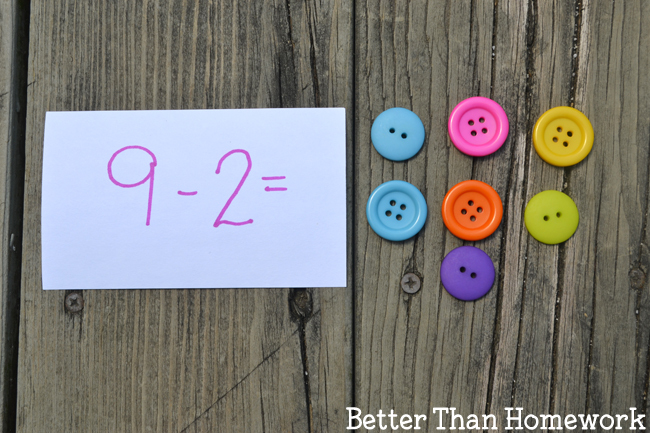 You don’t have to keep your subtraction problems under ten. 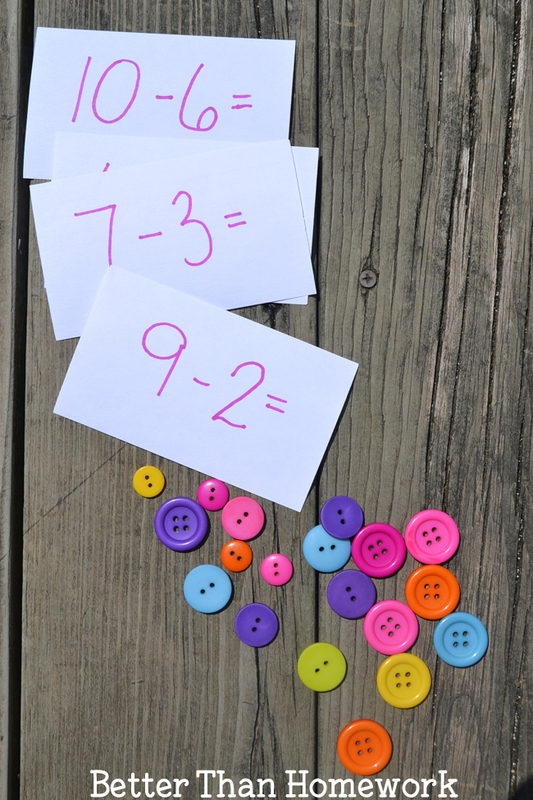 *When your child is more comfortable doing subtraction, have them find the answer in their head and then count out the correct number of loose parts for their answer. 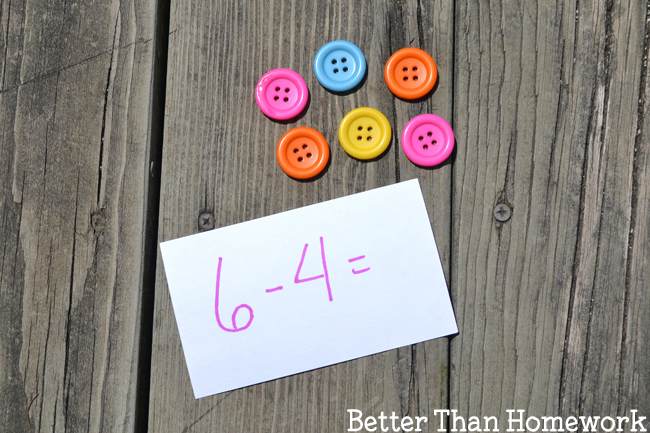 *Use this method for doing subtraction on the go. Use rocks, sticks, acorns, or other natural items as your loose parts. *Take this math activity outside and write your subtraction problems on the sidewalk with chalk. Have your child find the loose parts they need to solve each problem. 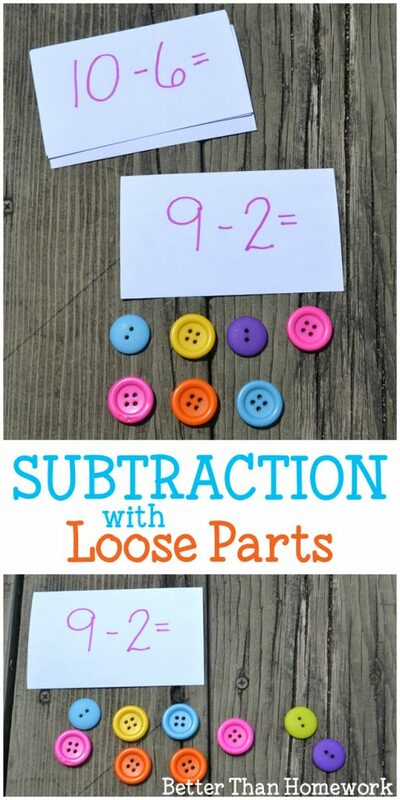 If you enjoyed this subtraction with loose parts math activity, the above photo is perfect for sharing on Facebook or you can share the photo below on Pinterest.